DTI Data is announcing today that an Alpha testing program will commence in order to aide in the facilitation of their bleeding edge ‘RAID Discovery’ technology. That weakness is the creation of ample test data for the technology to stress it to the point of breaking. This program involves the principal designers of the technology as well as the support staff of DTI Data. 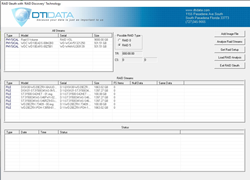 The Alpha Free RAID 5 Software Diagnostic program also includes new and current clients who have RAID recovery needs. Where does DTI get these real world scenarios for their Alpha test bed. From those who will benefit from it the most. The end-user. In a move that throws profit and bottom line management out the window, DTI is sending out a call to all those users who may have a RAID that is currently not functioning. What DTI proposes is that the drives for the RAID be sent to their labs in Saint Petersburg Florida where trained technicians will create real world images as a basis for a test data pipeline. In other words, DTI Data will in fact use the new toolset ‘RAID Sleuth’ which employs the bleeding edge technology ‘RAID Discovery’ and apply it to the damaged RAIDs. From that test data a report will be generated and given to the end user with our thanks as well as a discount for any future recovery needs they may experience. We offer the discount as a thank you for allowing DTI to use their hardware and more importantly, their scenario in the fine tuning of our ‘RAID Discovery’ technology. The images are then used to fine tune not only ‘RAID Sleuth’ but the ‘RAID Discovery’ technology. Once testing is completed and the software is fully vetted ‘RAID Sleuth’ will be released as a toolset for all technicians to use without cost. The ‘RAID Discovery’ technology will be placed in the hands of thousands of technicians with the simple push of a download button. DTI Data has for years been the forerunner of new development tools in union with new development techniques. ‘RAID Discovery’ has brought out the best in DTI and it is their hope this work will benefit all of IT.